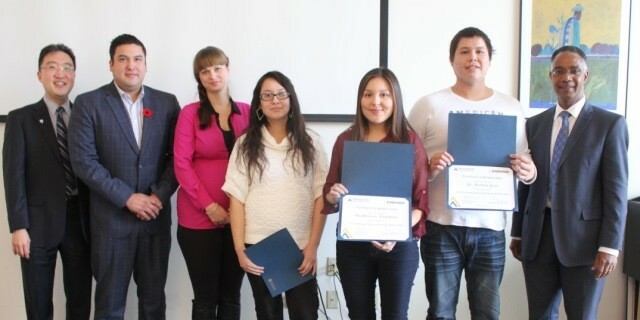 BRANDON, MB – Together with their families, student recipients of the 2013 and 2014 Enbridge Dakota Language Scholarship celebrated their achievements with members of Brandon University’s senior administration and representatives from Enbridge Pipelines Inc. at a luncheon held on campus in November, 2014. In attendance was the Enbridge Dakota Language Scholarship recipient for 2013, Jillian Chalmers, currently in her second year at BU, as well as the two recipients for 2014; Shannen Wombdiska and Matthew Pratt, both in their first year at Brandon University. These students, all from Sioux Valley, were welcomed and congratulated by Enbridge’s Roshan Kastrinos, Senior Aboriginal Community Investment and Training Advisor, and Karl Zadnik, Aboriginal Relations Advisor, Manitoba Region. This celebration marks another milestone in the partnership between Enbridge and Brandon University, which began in 2012 with a $60,000 commitment to the Faculty of Arts in support of the Dakota Language Program. Enbridge directly funds the Dakota Language Program in the Department of Native Studies, and supports two annual scholarships of $2,500 each for first year students enrolled in the Introduction to Dakota Language course.